When the owners of the 1940s brick house first approached designer Ty Larkins in 2010, it was with the intention of redecorating their living room. 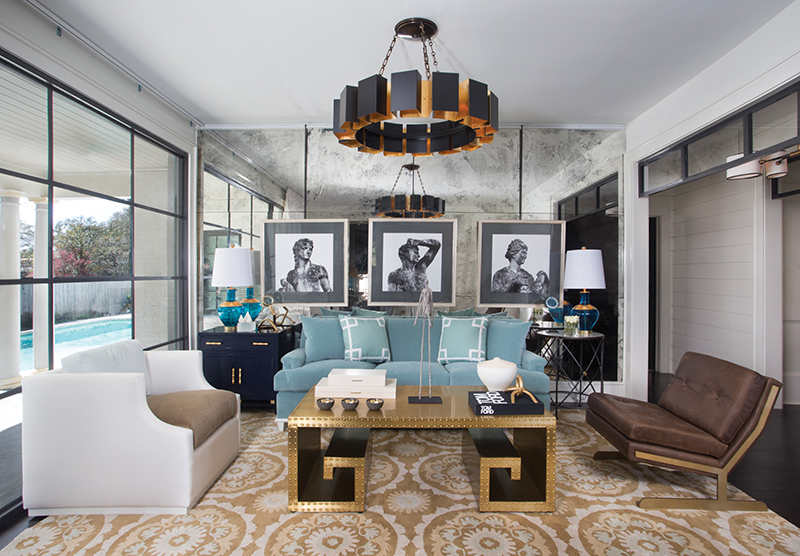 “They wanted to bring it up to speed and furnish the room and to tackle the dining room at some point too,” says Larkins, who founded Ty Larkins Interiors in 2006 and whose own home has been featured in House Beautiful. As promised, the owners — a dentist, his wife and two young daughters — did call Larkins in 2012 to follow through with the dining room. Two years later, they called again — this time, to address the rest of the house. While the architect did the exterior elevations and the interior floorplan, Larkins handled the redesign of the interior architecture — from kitchen and baths to millwork and trim. 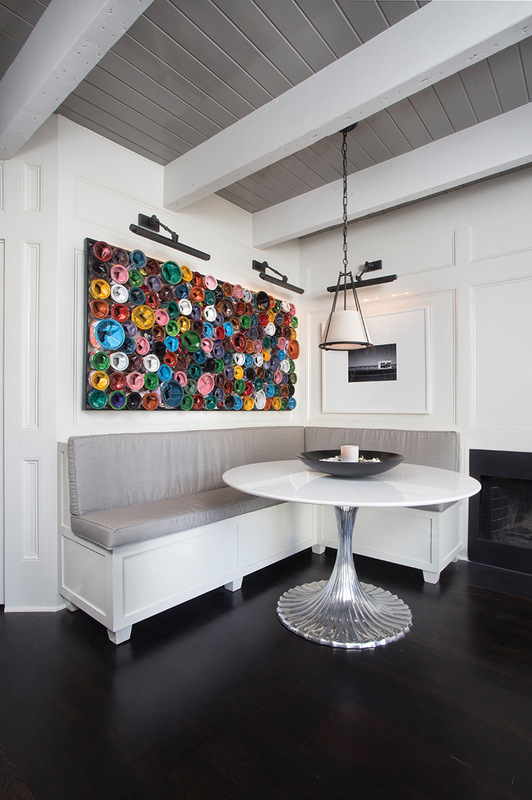 The remodel involved gutting the interior to the studs and creating a more cohesive design scheme. “We redid all spaces top to bottom with the exception of living and dining rooms, which we had already done,” he says. To play up the cottage character, he highlighted and married the disparate wooden floors throughout the house with a dark ebony stain, added shiplap painted high-gloss white to a previously drab stairwell, and had a stenciled pattern painted onto the floor of the master bedroom. He also designed highly customized details — such as the stainless steel stove hood edged with brass and the antiqued mirrored wall panels in the den overlooking the pool — to elevate the cottage’s simplicity with a more polished point of view and open the door for a younger mix of furnishings. Where Larkins did use traditional furnishings and decorative elements, he considered them in a new light or enlivened them with the unexpected. He juxtaposed the dining room’s traditional wallpaper and drapery, for instance, with a triptych of mirrors that sit on the floor screen-style and with dark teal crown molding instead of white. When an oak cabinet inherited from the wife’s grandmother seemed too modest for the newly enhanced dining room, he had it painted, then utilized it like a mantel by pairing it with sconces and a mirror. 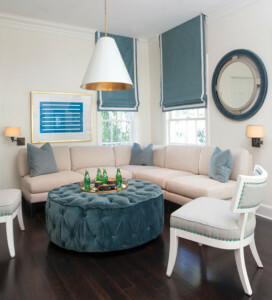 Though the backdrop of the house is neutral, Larkins incorporated color throughout. Splashes of blue — the woman’s favorite color — punch up the backdrop of the white living room. A similar blue is also the central color of the dining room and reappears in other parts of the house, including the family room, where it was used to cover the sofa. 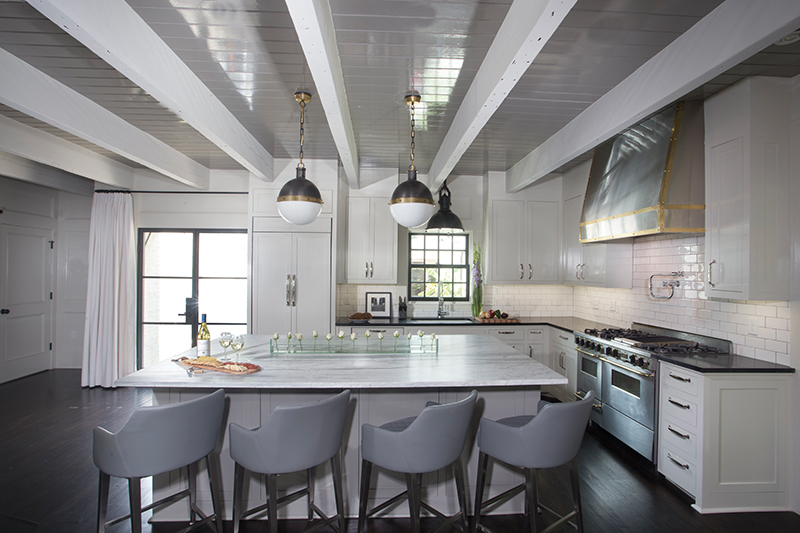 In the kitchen, which is predominantly gray and white with touches of warm gold, Larkins used strategic variations in gray to highlight the base of the island and the white beams overhead. He continued the use of gray in the master bedroom, along with cheerful shades of mustard, one of the wife’s favorite color combinations. Rather than having the piecemeal effect that results when different parts of a house are renovated at different times, the interior now works within the context of the architecture and has a continuity that reads as a whole.